Ingredients: If you liked the action of Twilight, the surrealism of Edward Scissorhands, and the failed drama of The Raven, you will like this movie. I consider myself a Tim Burton fan, I love his melancholy vision and his creative approach to the pointing out the absurdity of normality. But Dark Shadows is bad. It’s bad, bad. 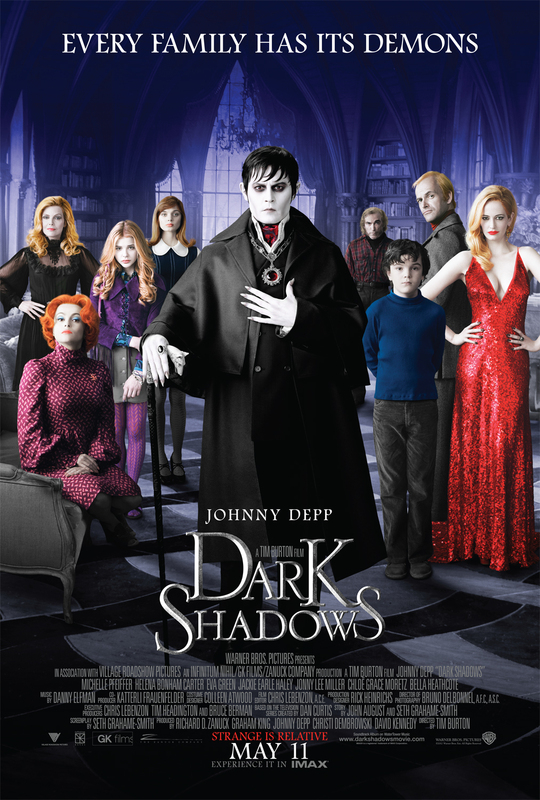 The film centers around the tragic life and history of Barnabas Collins (as played by Johnny Depp) and the struggles of the cursed Collins family. When Barnabas spurns the love of Angelique Bouchard (played by Eva Green) she resorts to witchcraft to kill his one true love, Josette DuPres (played by Bella Heathcote) and curses him to an vampiric eternity. Collins is then locked away in a box for 200 years, 197 years if you want to get technical, until he finally awakens in 1972. When he finds that the ancestors of the Collins family are in dire straits, he takes it upon himself to put everything back in order. Dark Shadows starts off with a lot of potential, mimicking the TV show it was based on, incorporating elements of the supernatural along with soap-opera moments. But after the 30 minute mark, the movie lost direction in a big way. Sub-plots run amok, character motivation goes out the window, and the comically overdramatic tone dissipates, leaving behind a mess of disjointed scenes made worse by sloppy writing. Helena Bonham Carter, as Dr. Julia Hoffman, and Johnny Lee Miller, as Roger Collins, played completely superfluous characters. How unimportant were they? The movie dispatched them both within the same five minute window and it didn’t affect the plot in the least. The supernatural elements become pointless unexplained schlock, good only for an impromptu “love scene” and the standard Hollywood monster-movie finale. And there’s so much damn inconsistency. The Barnabas Collins character is a traditional vampire -- no sparkling here -- yet sometimes he can walk around during the daylight and sometimes he can’t. Angelique’s witchcraft sometimes requires her to utter an incantation or preform a ritual but then she doesn’t. Maybe I am getting a little too caught up in the minute details but considering how little anything of importance happens in this film, I had plenty of time to dwell on it! Though, I think the greatest offense of all is the squandered potential of Jackie Earle Haley, as the comic-relief caretaker, Willie. I didn’t know much about the original Dark Shadows series and I got the impression that Tim Burton and Johnny Depp did really want to make a good movie adaptation of it, to a point. Then, the movie crashed and crashed hard. The movie would have been stronger if, like the series, they had focused on the family, their deceits, their paranoia, their relationships. Instead, all that was set aside to showcase Depp’s impersonation of a vampire. The bad writing literally sucked all the nostalgia value right out of the film --eh, see what I did there.